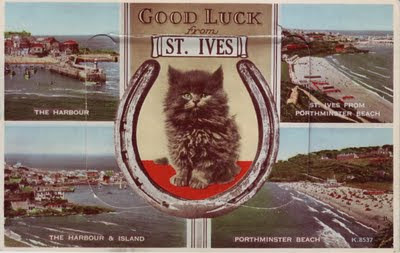 I'm not a huge fan of cutesy kitten cards but this is such a great example of a vintage mailing novelty postcard, featuring one of my favourite seaside resorts, that I just couldn't resist it! St.Ives is a Cornish fishing village which has been a long time favourite amongst British holiday-makers and surfers, as well as having had a thriving art-scene for many years. This Valentine's Mail Novelty Postcard includes a flap with a foldout section with eleven views of its beaches and surrounding beauty spots. Whilst some novelty cards were posted in envelops to protect the moving parts, this was posted as a regular postcard on 24 July, 1958, yet survived its journey and indeed, the subsequent years, in excellent condition. By the 1950s, the massively prolific Valentine’s Co. Ltd, which had been producing postcards since 1896, had shifted its interests to the production of the increasingly more popular greeting cards, making this one of their later editions.